ellagata: In the holiday spirit! Hello there! I hope you are doing fantastic and thanks you for checking out my blog. So I was going through my blog and wonder, why I haven't done another post? 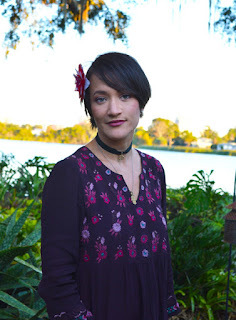 Well there is not a correct excuse but I remember how I enjoy this whole thing, so here I bring you a post, It is winter in Orlando and the weather is chilly but not that cool, so we can still show some skin. 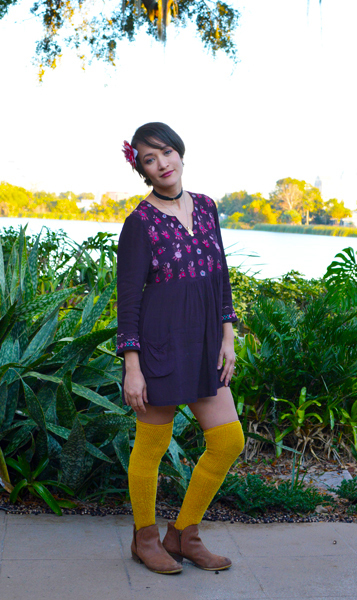 You can do this outfit with a long sleeve dress and any over the knew socks you have. Hola! Espero que estes muy bien, gracias por estar aqui en mi blog. Estaba visitando me mi blog y pensando porque no e hecho mas entradas y la verdad no hay una razón suficientemente buena para no hacer algo que disfruto tanto como hacer el blog, asi que aqui te traigo otra entrada de fashion, en Orlando esta haciendo un poquito de frio asi que todavia se puede mostra un poco de piel. Este look lo puedes replicar con cualquier vestido corto manga larga y medias largar.